In today’s job searching climate, technology has ironically made it both easier and more difficult to land your dream job. There are hundreds, if not thousands, of job search boards and due to more sophisticated communication technology, job seekers can now interview for a job halfway across the country, or the world, from the comfort of their own home. But all this convenience is not without its drawbacks. If you’ve ever participated in a video interview, the first word that comes to mind is probably “awkward.” Delays, lost signals, weird uncomfortable eye contact and talking over one another are the rules and not the exceptions. 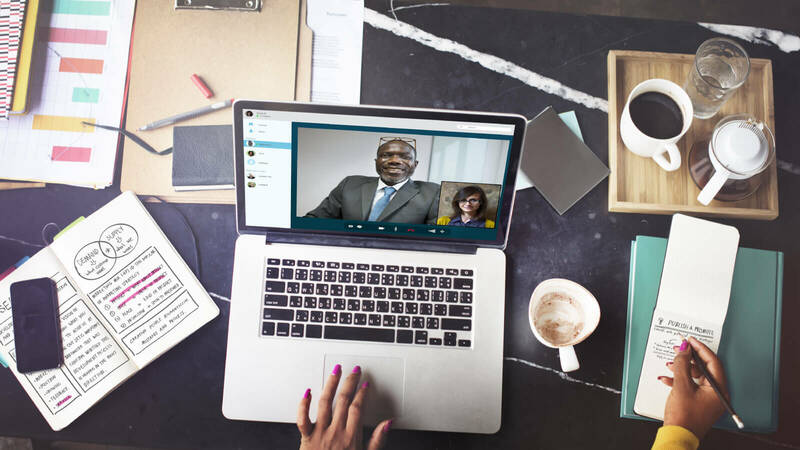 Despite this, the cost savings and convenience will ensure that video interviewing is here to stay. Here are five video interview tips to help avoid the awkwardness and make yourself stand out during your video interview. Conducting a dry run is one of the most important things you can do to ensure you come across as polished and professional. Coordinate with a friend to do a practice interview to make sure you are comfortable connecting to the call and that your equipment works. Do everything you can to ensure your internet connection is as strong as possible and practice with your conferencing equipment so that you are aware of tendencies to delay or lag in the transmission. The last thing you want during your interview is for the interviewer to be distracted by a pile of dirty laundry, glamour portrait of you or your spouse on the wall (as lovely as it probably is) or anything else blatantly non-professional. Practice proper job interview etiquette by setting up your computer in a clean, well lit area and do a trial run to see what is showing up around you on the screen. You can adjust your position and the angle of the camera to make sure only what you want portrayed is visible. A local coffee house will not afford you a quiet and professional environment. Nor will your kitchen table, if you have a house full of folks bustling around getting ready for their day. A video interview is every bit as much an interview as an in person one, so make sure you are properly attired. Proper job interview etiquette is to always dress appropriately for the job in which you are applying, not necessarily a day on the job. Even if you know the company has a casual dress code, most interviewers will be taken aback if you show up in jeans and a t-shirt. The same holds true for the video conference. You can change back into your pajamas and robe as soon as it’s done. Your preparation should be as intense for a video interview as any other. Google, LinkedIn and other resources make it inexcusable to be ignorant to the company’s product, mission and other information. Study up on the company and the interviewer to ensure you're ready for potential video interview questions. Prepare a list of things you want to learn during the interview and some questions you want to ask. It’s likely that if you adhere to the previous four job interview tips, you will already be a step ahead of the other applicants. However, there is one more big hurdle to cross and that’s the ‘eye contact’ phenomena of video conferencing. We are innately conditioned to show attention to people by looking them in the eye when they speak, and to nod and smile. When we are video conferencing it is almost impossible not to do these things. Remember, that when you make eye contact during a video conference, it should be with your web camera – NOT the person’s face on your computer! This feels very awkward, and is also distracting because you will continuously catch glimpses of your ‘paying attention’ face, and it will look strange to you. Resist the urge to fix your hair, wipe away a spot (unless it’s huge) or otherwise act like you are alone in front of a mirror. Focus on the fact that the camera is the interviewer’s eyes and make appropriate, non-staring eye contact, as naturally as possible. An interview is about showcasing your very best professional side, so follow these job interview tips and make sure your video interview does that for you and you will be one step closer to getting hired.